Hunter McElrea described his win in the 2018 Formula Ford championship as ‘unreal’ after a title fight that went to the wire. In a dramatic season finale at Sydney Motorsport Park, McElrea came to blows with title rival Hamish Ribarits at Turn 2, dropping the former to eighth in the order. A 35 second post-race penalty dished out to Ribarits meant he fell to 14th in the results, with McElrea ultimately crowned champion. “This just feels unreal,” said an elated McElrea. “I can’t thank Mick and Maria (Ritter) from Team Sonic enough for everything they’ve done for me over the last two years. For the New Zealander, the success means he receives a ticket into the Mazda Road To Indy Shootout, which could land him a drive in the USF2000 series. McElrea has already raised eye-brows in the United States after proving the quickest in the Chris Griffis Memorial Test at the Indianapolis Motor Speedway road course in September. The 18-year old is now set to return to the US to represent Australia in the Shootout which will take place in December at Wild Horse Motorsports Park outside Phoenix, Arizona. “I can’t wait to go over there. I’m really excited to head back to the US and chase my dream, so I can’t wait,” added McElrea. 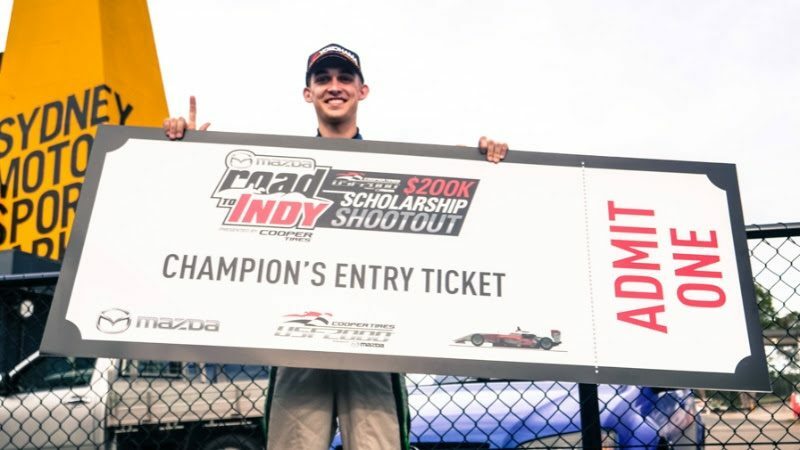 The winner of the Shootout will be awarded a US$200,000 (AUD$280,000) scholarship from Mazda to compete in the 2019 USF2000 Series. McElrea has made no secret of his dream to compete in the Indianapolis 500, with the Shootout taking him one step closer to that goal. Australian Matthew Brabham won the 2012 USF2000 Series before going on to win the Pro Mazda title in 2013. Following two seasons in Indy Lights, Brabham gained a berth in the 2016 Indy 500 with Pirtek Team Murray. Nathan Herne took out the round win in the final event of the season in Sydney.